Worker making apartment renovation by project. Builder making a mark on the plan. Workers studying the draft of a house. Builders are prepare plan of a large apartment. 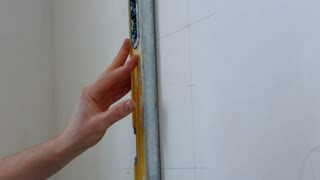 Builder draws marking on the wall. Worker making measurements. Builder processing concrete. 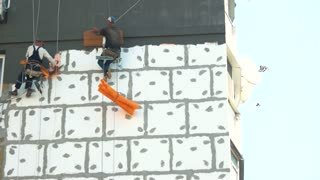 Worker make renovation of apartment. Laying floorboard. Team of builders make renovation of apartment. Laying parquet. Team of builders make repairs living room. Renovated apartment. Preparatory phase of house renovation. Working group is studying a plan of apartment. Business professional contractor. Renovation diy couple making a choice for paint colors of house interior walls and embracing with love and happiness in new apartment. Positive family choosing color with samples palettes at new home. Carefree happy homeowners having fun, making dance moves and singing aloud while making renovation of new apartment. Playful overjoyed couple rejoicing painting interior wall with with paint rollers. Positive multiracial couple in love fighting with paint rollers while making renovation at new apartment. Lovely wife standing on ladder and husband painting interior wall and applying white paint.